What is the difference between cosmetic teeth cleaning and a dental prophylaxis? Anesthetic –free teeth cleaning is a procedure performed on your pet while they are awake. Removing abundant scale has value in reducing oral bacteria and slowing gum disease, however it is difficult, often impossible to reach under the gum line or treat the interior side of teeth. Anesthetic –free dentistry can provide an improvement in the appearance of the teeth visible to the client but should not be considered a complete prophylaxis. Dental prophylaxis under anesthetic performed by a veterinarian includes complete scaling of the crowns and under the gum line of each individual tooth and polishing of all surfaces. Examination of their oral cavity, including an evaluation of their tongue, gums, lips, and teeth is performed. 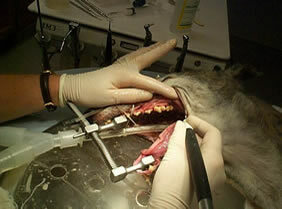 Probing of each tooth to assess their roots can be completed with anesthesia with no discomfort or stress to your pet. Dental x-rays will be taken to evaluate problems below the gum line such as infected or fractured teeth. Regular examinations will allow your veterinarian to assess whether more complete dental treatment is needed to keep your pet healthy and comfortable.